Chalazion is a swelling in your eyelid caused by chronic inflammation within the small oil producing glands of the eyelids. A chalazion is a reaction to trapped oil secretions and can become secondarily infected by bacteria. Chalazion can be small and without symptoms, and they may disappear without treatment. If the chalazion is large, it may cause blurred vision by distorting the eye’s shape. A chalazion is sometimes confused with a stye, which also appears as a lump in the eyelid. Chalazions usually are farther from the edge of the eyelid than a stye and are usually less tender. 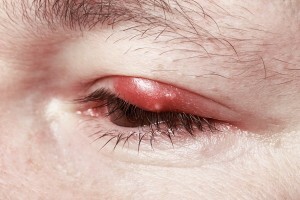 A stye is caused by infection of an eyelash follicle and forms a red, sore lump near the edge of the lid. Chalazia usually respond well to treatment, although some people are prone to recurrences and may require ongoing medication and evaluation. The symptoms described above may not necessarily mean that you have a chalazion. If you experience one or more of these symptoms, contact us today for a exam.